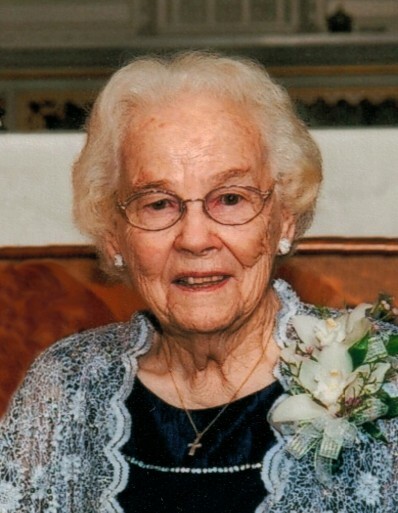 Jeanette M. Finder, 94, of Pacific, passed away on Thursday, February 21, 2019. Mrs. Finder, daughter of the late Benedict Graser and his wife Elizabeth (nee Rengel), was born January 1, 1925, in Villa Ridge. She received her education from St. John the Baptist (Gildehaus) School. On July 31, 1946, she was united in marriage to Richard Finder at the Immaculate Conception Church in Union. Mrs. Finder was a member of St. Bridget of Kildare Catholic Church in Pacific. Among her survivors are two sons, Robert Finder and wife Sheryl of Adelaide, Australia and Kevin Finder and wife Joan of Affton; three daughters, Mary Beth Fagan and husband Michael of Huntington Beach, California, Babs Maune and husband Harold of Washington, and Kathy Schuckmann and husband Bob of Pacific; sister, Irene Graser of Villa Ridge; ten grandchildren, Stephanie, Kathryn, Bridget, Elizabeth, Betsy, Brian, Hannah, Julia, Adam, and Sarah; two great-grandchildren, Natalie and Abigail; other relatives and friends. She was preceded in death by her parents; husband, Richard Finder; and two sisters, Dorothy Boehmer and Viola Skornia. A visitation will be held on Monday, February 25, 2019, from 4-8 P.M. at Nieburg-Vitt,Thiebes Funeral Home. A Mass of Christian Burial will be held on Tuesday, February 26, 2019, at 10 A.M. at St. Bridget of Kildare Catholic Church in Pacific, with interment in the Church Cemetery. Memorial donations are preferred to the St. Vincent de Paul Society or St. Bridget of Kildare Catholic Church.